I know the 09/10 Idea Book and Catalogue has been out now for just over two months, but one of the sets I knew I had to have was Trendy Tree's. However, as I'm more of a hobby demo who does the occasional workshop, this set had to wait until my second order...sigh! I have it now though, which means I can post something that doesn't include Pocket Silhouettes! To kick off my stamping with this set, I thought I'd start with a really simple card using natural colours. To add a little something, I've pierced the top and the bottom of the Kraft cardstock just to break up the layout a little. * Trendy Trees Stamp Set. * Kraft, Whisper White, Chocolate Chip and Kiwi Kiss Cardstock. * Chocolate Chip & Kiwi Kiss Stamp Pads. * Mat Pack & Piercing Tool. Love it, love it! These are soooo my colours. I love the simplicity of this, and the piercing is fab! Love that stamp set too. It's on my wait list. Love what you have done with this card. This is really pretty, great choice of colours. You've used 2 of my favourite things, Trendy Trees and Kraft. Love how such a simple layout can look so effective. I think the paper piercing kit will have to be added to my next order. This set is great isn't it? 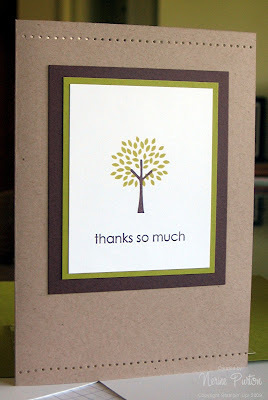 You don't need to add much at all to make a card look fabulous-just like yours! Lovely Nerine! I love this set! Great colour combo!